Former Federal Reserve chairman Ben Bernanke is bullish on blockchain. 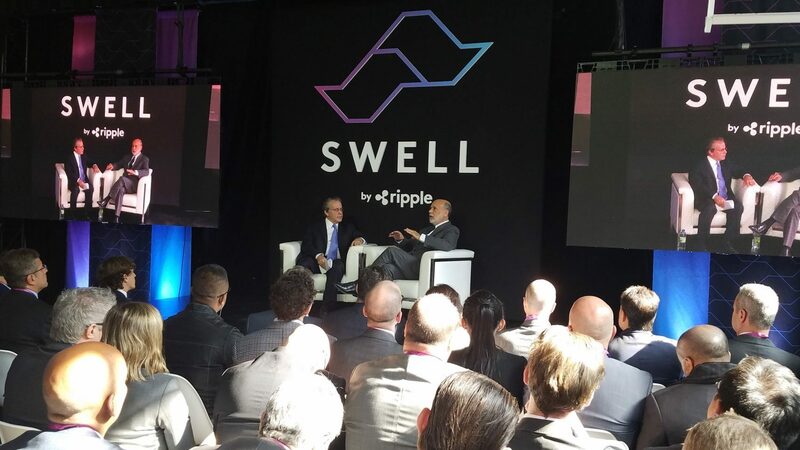 Speaking at Ripple’s Swell conference in Toronto today, being held the same week and in the same city as Sibos, the annual gathering hosted by Ripple’s rival Swift, Bernanke told a room of several hundred attendees that he believes payments can be slow and expensive as designed using existing tools today. Bernanke, now a distinguished fellow in residence at the Brookings Institute, called out Ripple by name, saying that he’s read about the company’s work and thinks that any effort in payments to reduce cost, improve accuracy, speed and reliability and “bring the global economy closer together” is a good thing. While the conversation mostly focused on monetary policy, Bernanke was asked to comment more on cryptocurrency and blockchain during the question-and-answer session, and his responses should come as no surprise as he gave bitcoin both muted praise and criticism as far back as 2015. And that attempt, he contends, won’t succeed because governments won’t allow it. “When bitcoin becomes a threat they’ll take whatever action” deemed necessary to quash it, he said. Unlike bitcoin, which works against regulators, he continued, blockchain businesses that collaborate with governments will likely see more momentum in terms of innovating on the payments system. Central banks around the world (including in Singapore, the U.K. and Europe) have taken more of an interest in blockchain technology recently, trying to figure out how it might create efficiencies within their systems. Case in point: earlier this month, senior vice president at the Federal Reserve Bank of Boston Jim Cunha said blockchain and other fintech startups would be pushing incumbent financial institutions and middlemen to be more innovative in their approach. When asked if bitcoin, other cryptocurrencies and blockchain might affect monetary policy, Bernanke said he doesn’t see that happening.